As Kammy would say, it really has been "unbelievable Jeff" as for the last few days, Sky Sports presenter and Prostate Cancer UK ambassador, Jeff Stelling has been ploughing through his 10 marathons in 10 days walk - an effort which will see him have walked an incredible 262 miles down the country, calling at 31 football clubs on the way. 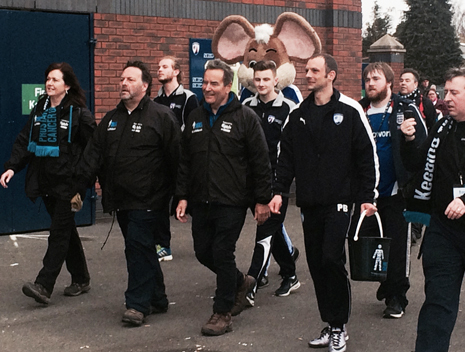 Today (Thursday 24th March) was Day 4 and so it must of course be Chesterfield where Jeff (above centre) was headed! 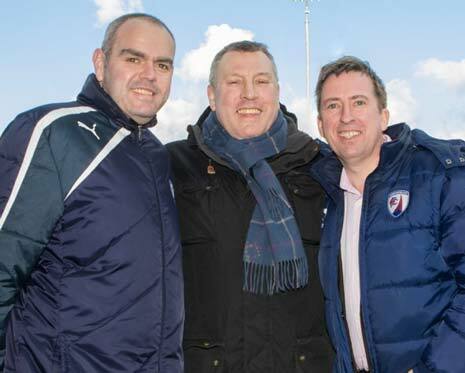 He wasn't alone, arriving at the Proact Stadium on time and with Angela Culhane CEO of Prostate Cancer UK, Nigel Adkins, Sheffield United Manager and Chesterfield CEO Chris Turner, Head of Media Nick Johnson and former player Bob Newton. They had had a mere stroll - clocking up just 36.1km as they walked from Rotherham's Aesseal New York stadium to the Proact via Hillsborough and Bramall Lane. Jeff Stelling was tired but in buoyant mood as he greeted the waiting public, telling The Chesterfield Post, "I think it's going OK! I know this is a hilly area but I felt like I was walking Mount Kilimanjaro. It was a long tough walk but we had incredible support from the public, it's been brilliant! "I'm doing it because prostate cancer has been largely ignored. But, when you look at the statistics - 1 man will die per hour, meaning 240 men will die whilst we're walking, so it's pretty scary. It's a cancer which is treatable if caught in the early stages so the initial idea was to raise awareness and, if you're from a potentially vulnerable area, then talk to your GP and just make sure you're OK.
"We've involved footballers, as football is a still largely a male dominated area, so it's a great way of getting our message over. In ten years, we want these football grounds to be as full of the same men as they are now, so that's why we are doing it! "I have an ulterior motive - I need to make sure these men are still around to make sure my viewing figures are up there! "We have had great support, Russ Green, the CEO of Hartlepool United, is doing the whole walk with me, Stephen Fry and Ollie Murs sent messages before we left and we've been joined by some great people - Alistair Campbell, Sir Ian Botham, Nigel Adkins, Kevin Sinfield - I have fantastic gratitude for their support! "If people want to give on the website, it is www.menunitedmarch.org, if you can't give come and follow the route and give us a shout, people's support gives us such a lift to see them standing on the corner waiting to see us." Angela Culhane said she was, "Overwhelmed, having done it for one day and knowing how my legs ache, I am full of admiration for what they are doing! Prostate cancer affects 1 in 8 men and there are about 10,000 men a year dying from it and that is set to increase, We have to get on top of it and stop it being a killer. "The really difficult thing with prostate cancer is that there are often no symptoms, so men really need to be really aware and have conversations with their GP and, if there are any symptoms, such as changes in their urine flow, then it is vital they see their GP and make sure as if it's picked up early it is easier to treat and has a much better survival rate. "There is lots of information on our website and our helpline and specialist nurses and I would encourage anyone to gibe them a call and work through any worries you have." Every penny is vital for support and research and the familiar faces (such as the guys from Soccer Saturday) and also some fantastic people who are supporting Prostate Cancer UK are raising a minimum of £300 each for the charity. To make a donation, please visit www.justgiving.com/Chesterfield-FC. Jeff said: "I deal in statistics - but the ones we are dealing with here are shocking. One man dies every hour from this disease, that's six in the course of Soccer Saturday every week. One in eight men will get prostate cancer, and for black men the odds are even worse at one in four. "Within the next ten years, Prostate Cancer UK believes they will find the answers to make this disease something men and their loved ones no longer fear. I've met the scientists who pledge to do this and I can see how dedicated they are. But do to this we need to raise vital funds - and I need everyone to support me and all the men affected by prostate cancer by visiting menunitedmarch.org and pledging their support." Jeff has issued a letter to the public as he takes part in this personal journey - reproduced in full below. Please take time and support the guys if you can. For more than 20 years, it's been an honour and a privilege to host Soccer Saturday on Sky Sports. For me, it's the best job in the world. I've shaped moods, prompting celebrations and triggering despair in equal measure. If it's stats you are after, I'm your man. You could say I can talk the talk, but when Prostate Cancer UK asked if I could walk the walk too, things suddenly got serious. Last month Prostate Cancer UK warned that the number of men in the UK dying from the disease will soar unless urgent action is taken. If the rising death trend continues, by 2026, prostate cancer will kill over 14,500 men every year. However, they estimate that deaths could be cut in half if the key areas of improving diagnosis and treatment can be resolved in the next ten years. Within that decade, Prostate Cancer UK believes they will find the answers to make this disease something men and their loved ones no longer fear. I've met the scientists who pledge to do this and I can see how dedicated they are. But to do this we need to raise vital funds. That's why I've signed up for my Men United March. On Monday, March 21st, I'll set off on an epic walk from my beloved Hartlepool United to Wembley, a place Pools have never been. I'll visit 31 other football clubs and walk 262 miles - 10 marathons in 10 days to be precise - and hope to see your readers along the way. Please support me and all the men affected by prostate cancer by visiting menunitedmarch.org and pledging your support or text 'Jeff' to 70004 to donate £3.Or, to make a donation, please visit www.justgiving.com/Chesterfield-FC. 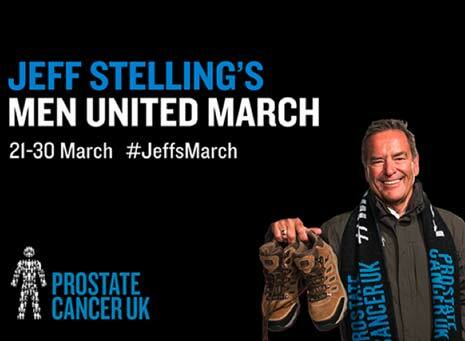 Jeff Stelling (Hartlepool born and bred!)"